Welsh swimmer Jazz Carlin admitted she never expected to get one medal in Delhi, let alone two. 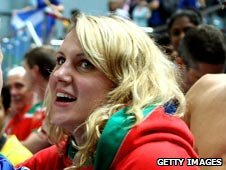 The Swansea-based 20-year-old followed up a silver in the women's 200m freestyle - Wales's first medal of the games - with a bronze in the 400m. She finished third behind gold medallist Rebecca Adlington. "I just can't believe I have come away with two medals. I was thinking about one medal at a push but to come with two I'm just so happy," she said. "I knew it was going to be hard because I wasn't feeling the best and [I was] a bit groggy in the heats. "But to come away with another medal ... I'm really happy with that. Even though it was my best event I was a bit nervous for it beforehand. "I had the 200m on the first day and this is day five. So this is five days later." Before these games a Welsh woman had not won a medal in the pool for 36 years. Now in the space of four days they have four. As well as Carlin, Gemma Lowe and Georgia Davies took bronze medals in the 100m butterfly and 50m backstroke respectively. "We definitely go the strongest teams that we have ever had. It's girl power at the moment.